"Twilight of the Apprentice, Part 2" / "Twilight of the Apprentice, Part 1"
"Twilight of the Apprentice, Part 2"
"Twilight of the Apprentice, Part 1"
Not to say I wasn’t enthralled. “Twilight of the Apprentice” has a slow, somewhat frustrating build that leads to an intense second half that’s both thrillingly mysterious and action-packed. There’s a commitment to the storytelling that’s fairly remarkable, and even the visual acumen improves, making use of the show’s limited CGI resources to make the setting both bizarre and chilling. Those four weirdly-shaped monoliths on Malachor’s surface were definitely striking, almost like giant graves marking the death and destruction underneath. Following our three Jedi underground, it felt like a graveyard from another world, which is saying something for a franchise filled with “other” worlds. It’s somewhat unfortunate that the episode doesn’t actually get into what exactly happened at Malachor–they never directly tie in the cataclysmic event from the planet’s video game origin–but it does make for an appropriate backdrop. The lack of seasonal development of some aspects really dragged down some of the more significant moments. Like, the Inquisitors: not only were the two (well, three) in this season were mostly ineffectual, the actual purpose of an Inquisitor is still rather unclear (in the sense that they’re not much different than any other Sith-trained lackey). The brief implication that the Seventh Sister and Ahsoka had history? Never address, as she’s easily dispatched–along with the two Brothers. Speaking of which, Ahsoka’s full potential felt underused all season: bursts of brilliance would shine through, only to sideline her for significant amounts of time. This has the unfortunate effect of making her final confrontation with Darth a bit lacking. It’s powerful, poignant, and tense–but it sort of feels like there’s a character beat missing. When Ahsoka cracks his mask and sees his face, she suddenly softens and offers to stay with him; the episode plays the moment with the weight it deserves but since we never spent much time with her personal struggle over this, it’s a moment that never really settles into place. “Twilight of the Apprentice” saves its biggest reveal with the reveal of Maul, the silent villain of The Phantom Menace. While I can imagine this being a fairly shocking revelation, there’s two major issues here. One: Maul has had a… complicated history from his two (three?) major arcs from The Clone Wars–which I’ll explain a bit more in the Stray Observations–but the finale gives us very little info about it. There’s value in jumping past all that and getting to the gist of his motivation: Maul plans to use the temple as a weapon to destroy his enemies. Yet the extent of his “enemies” is massive, and it might be unclear why he hates both Jedi and Sith without knowing what he’s been through (or how he’s alive in the first place). The second issue is that Maul’s reveal and side-trek with Ezra is a somewhat tedious walk-and-talk, in that somewhat-circular way where characters talk around each other instead of at each other. I do like Maul’s plan to slowly pull Ezra into his way of thinking (and eventual apprentice) is evident from the first second they meet; the idea that the young apprentice’s Dark Side tendencies are strong is a great thread to work from. It’s just would’ve been better served to hear more about Maul and how/why he’s working this angle, and how/why he’s even on Malachor in the first place. The Inquisitors first chasing the Ghost crew, only to be chasing Maul now, again, feels like a missing narrative beat. Yet as I mentioned before, it’s the episode’s commitment to the story that allows it to surpass the flaws, particularly in the second part. It was a bold move to separate Ezra and Kanan, a relationship that has always felt perfunctory on purpose. Ever since Kanan claimed to commit to teaching Ezra back in season one (“Do or do not, there is no try”), it’s been obvious that their rapport has not been that great, and that teaching sessions have been awkward at best and hostile at worst. It was the show’s most clever bit of development, a bit of misdirection that hid the bulk of those training sessions to lampshade the tension between them. So it follows that Ezra would easily fall into Maul’s manipulations, gaining power through the Dark Side on Maul’s orders. When Maul reveals that he plans to steal Ezra as his own apprentice, it figuratively and literally blindsides Kanan, who loses his eyesight with an errant lightsaber swipe from Maul’s hand. 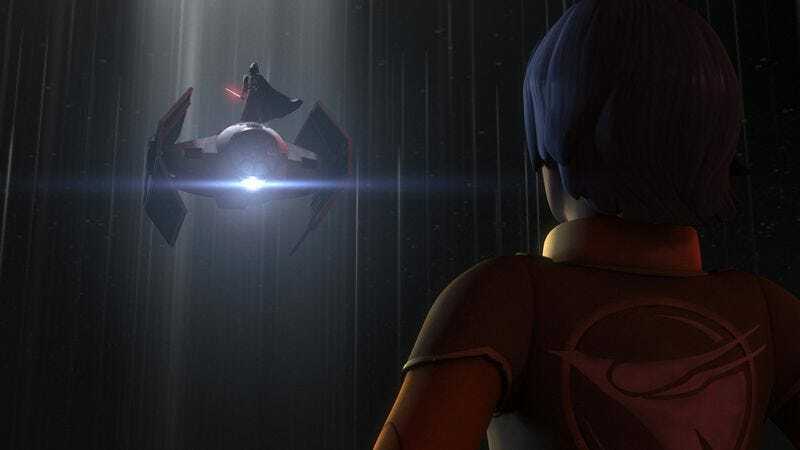 It’s a striking shot, a thematic outcome that represents all the times that Kanan failed to address Ezra’s various wanderings into darker territory. Yet even in his disfigured state, he manages to best Maul briefly and assist Ezra in pulling the Sith holocron from the switch that gearing to turn the temple into a battleship, all while wearing the mask of a Jedi temple guard. He still is a protector. There’s something to be said of the episode’s exploration of various characters who are strong in the Force/Dark Side but not quite Sith or Jedi ready. It’s telling that when Darth arrives, his presence overshadows everyone else’s. Watching Ezra, Kanan, Ahsoka, and even Maul work through their various relationships in such a dead, desolate place gives this finale a sense of scale that’s fascinating to watch, even if every piece doesn’t quite fall into place. The ending montage is surprisingly artful, with Maul heading off to god-knows-where, Vader emerging from the rubble but Ahsoka delving down below it, Kanan blankly staring at the ladder of the Ghost ship, and the various crew members in an extremely awkward position. And then there’s Ezra, who, staring at the Sith hologram, manages to open it while his eyes glow in a very Sith-like manner. “Twilight of the Apprentice” provides a tremendous episode that both lands as a finale and sets the table for a juicy third season, even if a lot of the particular details feel tossed aside or underdeveloped. I can’t wait. Okay, a brief Maul primer: The Nightsisters (a bunch of witches who use the Force in a more purely mystic way) needed a Dathomirian for some reason (the Nightsisters basically controlled all Dathomirians). They found one, Savage, and he was a vicious killer. He was bested by the Jedi then fled to some planet, where he followed some talking snake creature and discovered his brother, Maul, inside a cave, still alive but with no legs. He brought him back to the Nightsisters and they restored his body and health and gave him mechanical legs. He and Savage were killing a lot of people only to push back against the Nightsisters and the Sith (they were being used by both sides). Then they kind of became gangsters for some Mandalorians, but then Dooku killed Savage and beat Maul because they became threats to the Sith for some reason. So this leaves Maul eager to exact revenge on everyone. Like I said, I can see why the show skipped all that, but maybe they’ll explore it more in season three? Just to give his war against his “enemies” some context. I am also disappointed in the show not getting into what happened at Malachor, mainly because the Force wanted them to go there for answers. 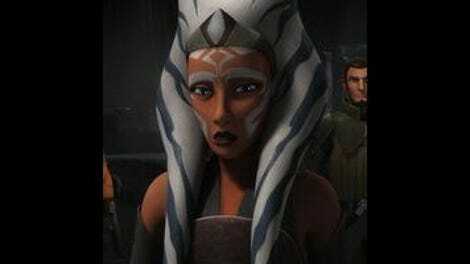 The massive deaths of hundreds of Jedi should have provided Ahsoka, Kanan, and Ezra some reflection, but it never came. Bye, Inquisitors, we hardly knew you. Seriously, we barely knew who or what you people were.